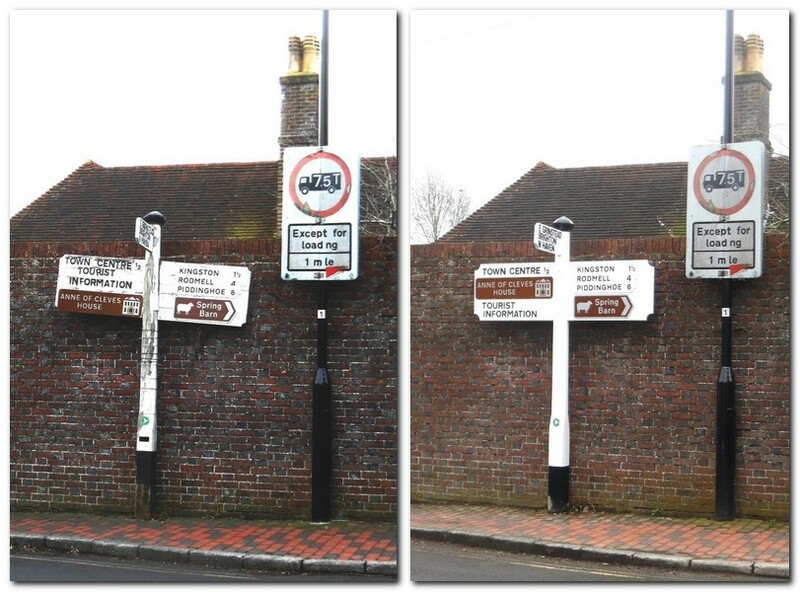 The old wooden signpost on Southover High Street by the mini-roundabout at the Swan has been repaired and restored after a request by Friends of Lewes. Concerned that the last old-style wooden fingerboard in the town was in a very poor state of repair, and was not likely to get to the top of East Sussex Highways’ list of repair priorities, the Friends of Lewes civic society sought the help of Steve Brigden, the Town Clerk, and a plan was hatched for Brian Courage, the Town Council’s Ranger, to restore it. It was in a bad way, but weeks of careful repair and re-decoration have seen it replaced, as these “Before” and “After” photos show. A good example of pragmatic co-operation: thanks, Steve and Brian!